I had a lovely ladies lunch of pulled pork pizza with my dear friend Lyndsay yesterday. It was a gorgeously sunny day and afterwards we wandered over to a newly opened ice cream place for swirls of soft serve with cornflakes, matcha, red beans, and sweetened condensed milk for dessert. It was a really, really nice day for Vancouver, but it didn’t last. While we were heading home we saw some crazy haze over the city. It didn’t look right and we both thought it was a little intense. It was a crazy chemical fire! In case it turned out to be the coming of the apocalypse and the city was destined to be attacked by chemical mutants, I decided to go out with what I imagine my ideal last meal in civilization would be: taco Tuesday Wednesday. I’m not talking about homemade carne asada or al pastor street tacos either. Nope, Mike and I had straight up old school crunchy Old El Paso tacos with ground meat, shredded cheese, iceberg lettuce and tomatoes. They tasted like childhood: warm, friendly, and safe. And for dessert, these matcha ice box mini cakes I made the day before. They’re a super straight-forward dessert. 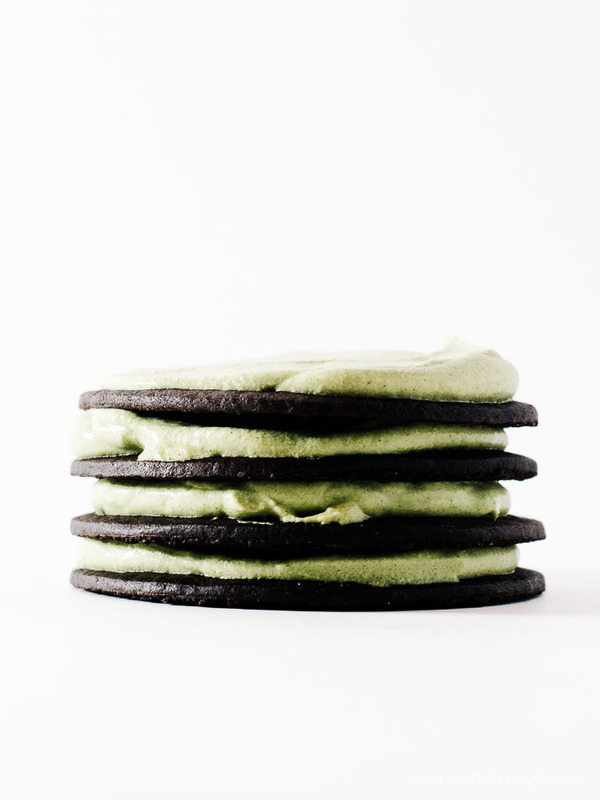 Chocolate wafers, deliciously dark and crisp, paired with un-sweetened matcha whipped cream. It’s a classic ice-box cake with a twist. If you’ve had ice-box cake, you know the dreamy texture of softened wafers, the way your fork slides through the layers with just the hint of resistance. Maybe you’ve even had chocolate and matcha together. They pair surprisingly well: matcha with its natural bittersweetness is a lovely foil to dark chocolate. Cookies and cream, what could be better? With a hand mixer, beat the cream until soft peaks form. Add in the matcha and whip until mixed. On a plate, lay down 3 wafers. 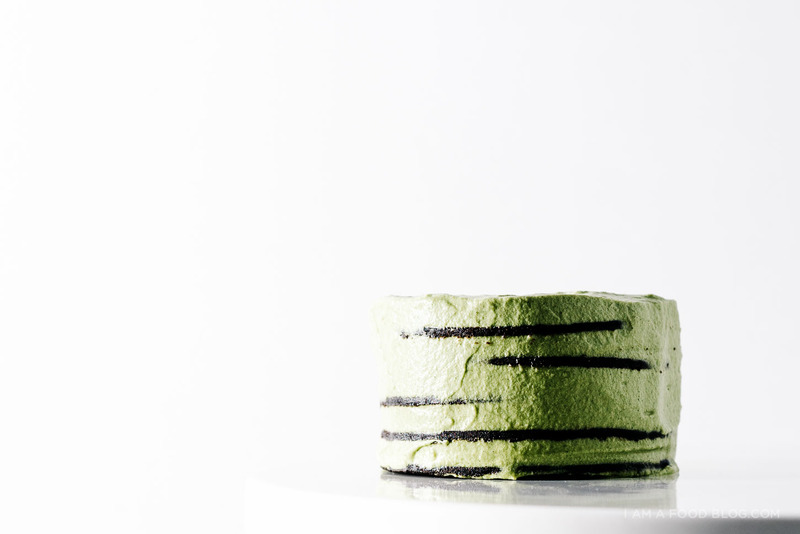 Top each wafer with about 2 teaspoons of matcha whipped cream. Add a wafer on top and press down slightly. Repeat until each mini cake has 4 layers. If desired, ice the mini cake all the way around. Place in the fridge overnight – this is when the magic happens. The wafers rehydrate and become cake-like. The next day, enjoy! Note: You can sweeten your whipping cream with a bit of sugar if desired. I kept it simple and on the unsweetened side and didn’t add any extra sugar. If you’d like your cream a little sweeter, add the sugar in when you whip, starting with a teaspoon and going from there. Note: The wafers are classic chocolate Nabisco wafers. Matcha whipped cream is really dangerous and my self-control just can’t handle it. And if you freeze it, it makes a really yummy (and melty) ice cream. These look completely delicious! I have never had an icebox cake before but your description makes me want one very much! Beautiful! I need to get on the matcha bandwagon… This looks simple yet delicious! also… a chemical fire? say what??? Gosh, these are pretty. I love your photos! Ahhh these little cakes are so insanely gorgeous, Stephanie! I adore your photos, and that pretty green color!! Love! ice box cakes are the best! i usually make one at least once each summer! love how mini and cute these are, steph! sounds delicious! 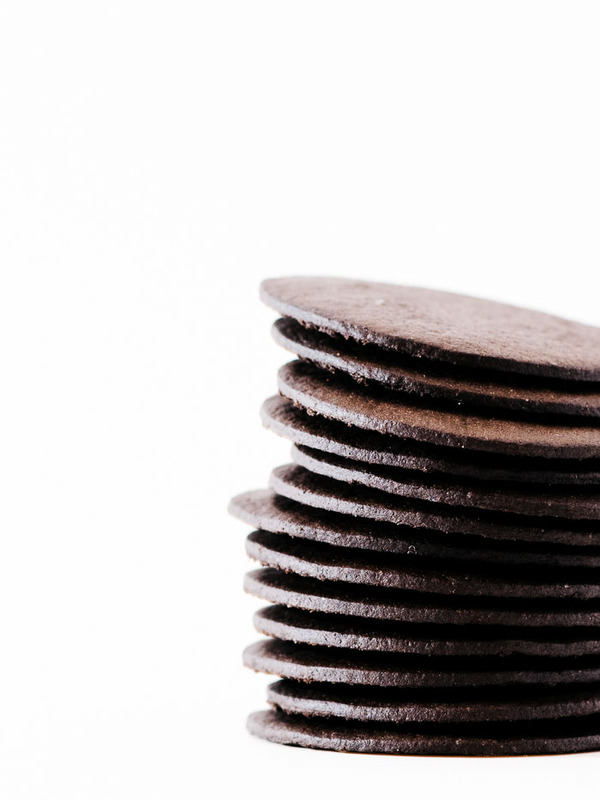 What type of chocolate wafers do you use? Can’t wait to try this. I have a secret sweet spot for those old el paso tacos too. Sometimes they’re totally want you want. A couple of tacos plus this? Perfect way to see out the end of the world in my book. These little cakes look super yummy! Love how easy they are to make! Matcha and chocolate is one of my favorite combinations ever and I love how easy this recipe comes together! this. this looks so good. I’ve actually never had icebox cake, but your description above seriously made me start drooling, which is not attractive, especially at work. Love this Stephanie! Genius! What kind/brand of wafers are you using for this creation? I googled ‘chemical fire’ and the news about Vancouver came up. DAMN!! I hope you guys are ok! I never had an El Paso taco, but I’m pretty sure that my last meal would be pizza. But I’m Italian so I’m sort of biased. I have guilty pleasure too, in mac and cheese form a box and packet soup. Funny how a lot of last day on earth meals come from your childhood tastebuds. Perfect shaped mini cakes Stephanie! I wish you could send me one! This cake is sooooo pretty. And it’s no-bake. So perfect for this crazy hot LA weather. Looks great!!! Where do you get the chocolate wafers? Aside from the Matcha flavored cream, this is a recipe from the 1950’s. The traditional recipe was one of my favorites. I thought this was a very sophisticated dessert when I was 8 years old. And I could make it myself! Just lay the cream covered cookies on their sides, refrigerate and cut on an angle. Thank you for this recipe! my daughter and I just made these and finished licking the bowl of leftover matcha whip! this was fun to make on a rainy day like today! What happened to the green tea? Isn’t there supposed to be some in this receipt??? Does it have to be matcha? I have tons of green tea goodies, but no matcha. Unfortunately, it has to be matcha (powdered green tea) in order for it to blend easily into the whipped cream. Some of my students and I chose your blog post Mini Green Tea Chocolate Ice Box No Bake Cake to analyze in our writing class at Parsons School of Design. Some of the students in the class have been may decide to post their comments to you as a part of a self-challenge in the evolution of their writing skills. We are all food lovers here. I hope you enjoy! Your blog post got me thinking about my ideal last meal. However, I want to talk about the dessert for my last meal: green sticky rice cake with red beans. This dessert is one of the traditional foods of my hometown, Zhejiang. Because of the typical requirements for the ingredients, I can only eat this dessert in my hometown. There are three reasons why this dessert is rare in the world. First of all, my hometown is one of the provinces in China produces rice that can be made into sticky rice. Second, there is a special wild herb that only grows in my hometown. Last but not least, people only eat this dessert at the Dragon Boat Festival in June. However, it is my favorite dessert in the world. The taste of this dessert is very fresh, soft and sweet, but not greasy. The combination of wild herb and sticky rice makes the outer layer of this dessert taste mellow and savory. After you bite through the outside of the desert into the stuffing, you will feel the artful mix of sweetness and freshness. When all of the ingredients are mixed perfectly in your mouth, you can not stop thinking about having next bite. Another reason this dessert is so attractive to me is that everything is made by hand. The wild herb only exists in the fall, so people in my hometown have to collect wild herb in the early fall and make them into powder. Then, they have to make the rice into sticky rice by using a wood mallet. Furthermore, they have to make the red bean sauce the day people will eat the desert. If you have a chance to come to my hometown, I strongly recommend you try green sticky rice cake with red beans. I’m a student of Parsons New York, from Korea. My professor gave me an assignment for replying your post. Even though I visited your blog for my assignment, once I read your post, I got interested in your blog. I like the pictures of food you posted. It stimulates my imagination about food. It has vivid and bright colors and beautiful stylings. And your writing makes food more enjoyable. I want to try to make your recipes. Are you managing your blog alone? Or is there someone helping you? I’m asking you this questions because I think the photos on this blog are very professional and the layout of your blog is also amazing. As it’s the food blog, I guess you work in cuisine. 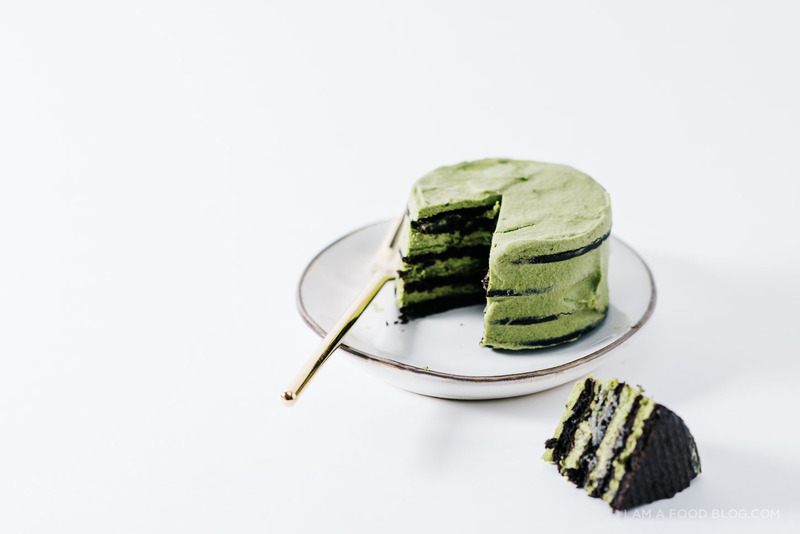 I like the ‘Mini Green Tea Chocolate No-Bake Ice Box Cake Recipe’. I like the combination of Green Tea and Chocolate. The bitterness of green tea controls the sweetness of chocolate. Also, I like the color combination of them. Brown and green looks so nice together. I will definitely make this soon. Hi Steph, it is so nice to read your food blog. I am a college student from Parsons, and I originally come from Shanghai, China. 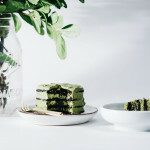 I extremely attracted by your mini matcha chocolate no-baked ice-box cake when I was browsing many of the food blogs. I am obsessed with all kind of chocolates since I bit it for the first time. Chocolates have some magic power to slide in my mouth. The smooth feeling, the silk touching and mellow tasting are remaining on the tongue for quite a long time. 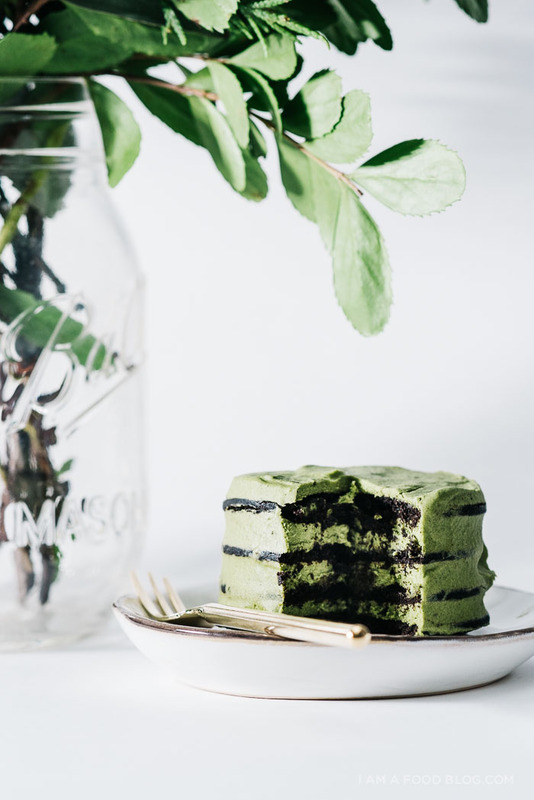 Reading your blog hook my desire to taste this amazing matcha chocolate cake. When talking about the last meal that I am going to have on the earth, I will choose chocolate. Besides the fantastic taste of it, it is something that can compensate energy for you. As a dessert, chocolate also can bring joys to you, too. If it is the last day on the earth, I must be very sorrow. Chocolate can be the best choice. 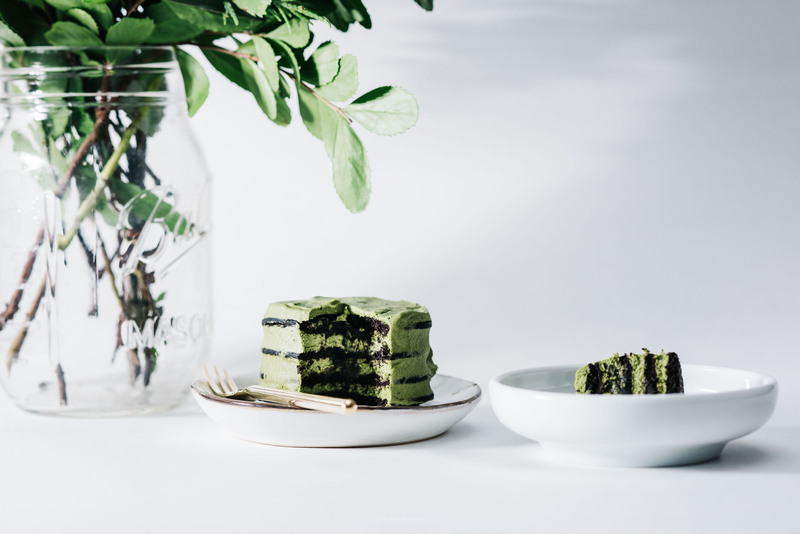 Of course, your wonderful mini matcha chocolate no-baked ice-box cake is always the first choice. Hey Steph, I love your blog. Let me introduce myself first. My name is William, and I am from China. One of my favourites is Mocha, which is what you made. I am addicted to desserts, especially cheesecakes. I would love to share my ideal last meal with you, which of cause is going to be about cheesecake. Since it is my last day on the earth, I would like to spend it with my family, by family I mean my mom, my dad, my little brother and my little sister. They are the ones I love the most. I always cook for them back home in Maryland. so for the last day, I would like to bake a huge cheesecake with different favors. My sister and brother are not allowed to eat cakes usually, but since it is my last day, I think my parents will be ok with it. Nuts, chocolate, different kinds of fruit. Nevertheless, MOCHA!!! This is my ideal last meal. I hope to see more food blogs from you and a thanksgiving meal plan~! Dear Steph, It’s great to know your blog. I am Kiera Junghyun Kim from Korea. In my English class I was given assignment to leave comment to this post, which was very intriguing from the title! Make a cake without baking! Since I am a dessert lover, I liked your post as your post starts out like any food blog entry discussing a lovely pizza lunch and an ice cream dessert afterwards in beautiful Vancouver. However, things take a turn for the worse as the weather becomes affected by a brutal chemical fire. Fearing for your life in case the mutant apocalypse was upon her, I love how you transition into talking about what might be your last meal on the planet. And in my opinion you couldn’t have chosen more wisely. I definitely love tacos as it is difficult to obtain authentic Mexican food in my hometown of Seoul. And crunchy tacos? even better. But you didn’t stop there, you went to another of my favorites…dessert, matcha ice box mini cakes. Your easy explanation and directions of this amazing dessert I never tasted had me wondering with excitement at what I would encounter biting into this delicious confection. Your imagination also made it an easy read and I enjoyed it thoroughly. After reading, I too began to imagine what would happen if the end of civilization was upon us. And then of course, what would my last meal be. I didn’t have to think too hard as I just ate what I wanted last week, a delicious Shake Shake burger. I know it’s not the fanciest thing I could choose but to me it’s warm to my heart as nothing could be better to me than their simple and fresh burger and obviously a side of fries. Before I had Shake shack burger for the first time, hamburger was not my favorite meal, never really loved it. However, Shake shack burger changed the standard of the hamburger I used to think of how delicious burger can be, especially with the juicy patty. I know there is nothing special secret about it, but now, I would need a finale if it’s my last meal after all and your matcha ice box mini cakes would be a perfect ending. Also, I was wondering how you enjoy sharing your story through blog and how you manage it too. sometimes you might busy to upload post in time.. and this post was very interesting to read, photos that used which definitely helped a lot to understand. If you could, It will be amazing to know! I am Yudi! This is a perfect blog and I really like it. Our teacher choose this blog as a part of our assignment which is to write about our ideal last meal. Your blog got me thinking of my ideal last meal. I am a half vegetarian. I don’t eat meat, but I love seafood. Therefore in my ideal last meal there are must be some fresh seafood and vegetables. A signature dish of Singapore called “Chilli Crab” is must be on the dining table. The fresh and juicy crab meat has a slight taste of sweet when it hits the strong black paper dressing on the crab shell the magic will happen in your mouth. The crab meat and the black paper dressing complement and contrast each other in both taste and texture, making this my favourite dish of all time.The flavour and the texture combine so well to highlight the sweetness of the crab meat and the fragrance of the dressing. Japanese food is the love of my life. There is a particular sushi that I cannot forget about. It is the “Avocado with fried soft shell crab roll” The crisp fried crab and the soft avocado , wrapped with the sticky rice and Umami nori. It is the best sushi I have ever have in my life. A bit of refreshment is needed as well. The lotus leaves dressed with sesame sauce will be the perfect choice for me. For my beverage I would like to have a kind of Chinese black tea named PU’ER. The fragrance of the tea smells like old wood and soil and it also consist the smell of that tea leaves. It taste a little like coffee but instead of the bitter and sour it is sweat and mild. The Pure tea has the effect of the oil solution so that I will not feel too heavy when I finish my ideal last meal .Finally, as for desert, I think your recipe “Mini Green Tea Chocolate No-Bake Ice Box Cake” will be a ideal desert for me I can imaging the rich taste and the ice feeling. I am willing to know what is your ideal last meal would be like and I really enjoy reading your blogs. Hope you will come up with more interesting recipes! Can I try this with vanilla wafers if that is a thing? My mom is allergic to chocolate, but she loves green tea. yes! you can do it with any sort of cookie, you just need it to let it chill out of a while so the cookies soften. hope that helps! Can I make it two nights prior to eating it?